No other product provides this much protection for your boat and water gear. Use Aerospace Protectant to keep your boat’s seats, sails, hull and windows colorful and clean. Aerospace’s marine formula is a premium protectant designed to safeguard boats and boat equipment against the damaging effects of daily exposure to UV rays. It’s safe for use on outdoor gear and apparel, too. Simply spray on and wipe dry to restore color and luster, repel stains from suntan oil and prevent fading even in the harshest marine conditions and sunniest climates. Aerospace Protectant will even help keep fishing gear clean and prevent inflatable boats from sticking together during storage. Not be used on unfinished leathers (such as suede), fabrics (canvas), or flooring. 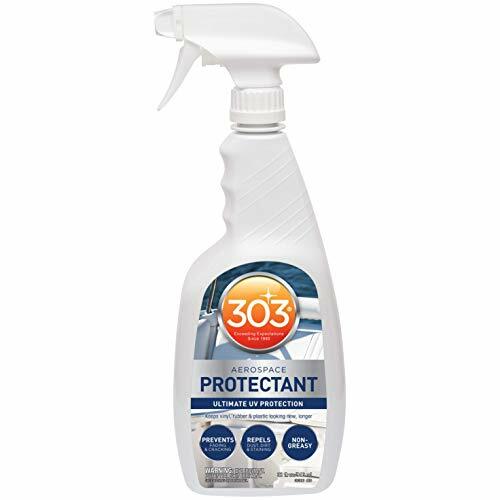 If you have any questions about this product by 303 Products, contact us by completing and submitting the form below. If you are looking for a specif part number, please include it with your message.